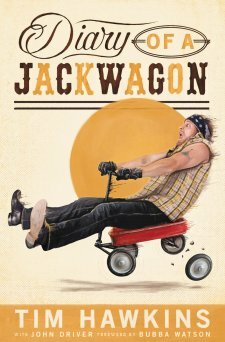 If you've ever seen any comedy videos of Tim Hawkins you'll be able to hear his voice as you read the book "Diary of a Jackwagon". In fact you might not be able to stop hearing his voice after you set the book down -- particularly if you're seen any videos of his comedic songs. Speaking of, I'm still super sad about what Tim did to "Dust in the Wind" -- to the point where I have to run out of the room with my ears plugged shouting "LA LA LA LA" whenever my husband plays it (over and over again). But, I was willing to forgive my husband and Tim and give the comedic book, "Diary of a Jackwagon", a chance. As with all comedy, some of you are bound to be offended by some of this book. The rest of you will be offended by other parts of the book. We can't all be offended by the same jokes after all. Themes in the book include marriage, parenting, parents, homeschooling, food -- pretty much a bit of everything. "In most arguments between a man and a woman, the man feels like he's on the same page. He just doesn't know how to read." "Whenever I want to be left alone, I go to the mall and hold a clipboard." If you like Tim Hawkin's comedy, or comedy in general, and you aren't the type to wallow in unforgiveness if he happens to offend you -- you should check out this book. If you haven't before, you should check Tim Hawkins out on DVD or youtube -- that way you'll have his voice echoing in your head as you read. If you can only do one or the other -- watch Tim performing -- half the comedy is in the words and half is in the visual and audible delivery. It might actually be 1/3, 1/3, 1/3, but I don't know the exact formula.